Lighting 5 candles, turning the lights low, switching the gas logs on high and bringing a tray of mugs overflowing with hot chocolate and whip cream all came together in about 5 minutes. The last touch was the familiar Celtic Christmas album that hummed gently through the room to bring the familiar comfort of a well-loved cd. My young daughter had just experienced a devastating tragedy that had made her innocent heart fearful—a fatal shooting at our church during the Christmas season a few years ago had wrought terror in our hearts. Snuggling up together under soft throws on the couch, she poured out her fears, worries, and questions for a half hour. I searched the files of my heart to find comfort to help her feel understood and comfort of the hope she had in her heavenly Father that would never be shaken. How surprised I was to hear this, as I have often felt that I was a struggler through the many challenges that threatened to overcome us in our lives. Many years ago, I realized that children long to have a happy mother. Our children are growing up in a time when media spreads the gloom and doom of catastrophes, fears and threats. When the mama spreads light and thankfulness--and hope in the darkness, then children feel secure and safe. But when a mama lives darkly, the children harbor fear, insecurity and blame themselves for parent's being angry or sad. Hope is not natural--it is supernatural. Hope comes welling up from deep inside because of a belief that God is good. That He will win in the end. That there is always hope when God is present. Women who choose hope and who choose to trust God are those who, instead of cursing the darkness, light a candle. But it is a choice of the will. Hope is not a feeling, it is a commitment to hold fast to what scripture reminds us is true about God. Knowing scripture, pondering and taking it into your soul, is what gives each of us food, fuel, to live the Christian life, as we listen to the Holy Spirit guide us through the wisdom we have learned. The only way to live well is to live in fellowship with God. Nothing else will satisfy. We live in an imperfect world filled with disappointments, devastation, and difficulty. 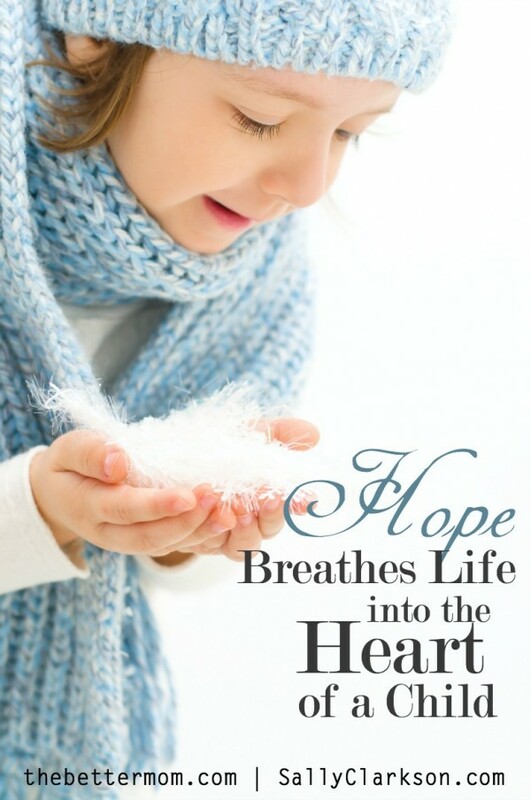 Without hope, our lives can feel absolutely purposeless sometimes. Go there for the rest of the story! and don't forget to listen to yesterday's podcast!